The Bowhead whale is one of the largest whales on Earth, it can grow up to 20 meters (66 ft) in length and 136 tons in weight. Up to one third of it’s body can be made up of it’s head and the Bowhead Whale’s huge mouth resembles an archer’s bow, thus giving the whale it’s name. Like other baleen whales, they swim with their mouth open, filtering the water and feeding plankton and crustaceans. These whales inhabit only the Arctic and subarctic waters, unlike other whales that migrate to feed or reproduce. The Bowhead Whales are usually black with a white spot on their massive head. They use their bony skulls to break through the ice to breathe, in turns with diving periods of about 4 – 15 minutes. The Bowhead Whale consumes about 2 tons of planktonic animals. Just like other baleen whales, they filter water through the baleen plates. hanging from their upper jaw. These plates are made of keratin, much like the nails of humans, that fray out into hair at their end. Small sea creatures are trapped inside the whale’s mouth and are then swallowed. The Bowhead Whales usually live in pods that vary in size and have a tendency to merge together, forming lather pods nearing the fall, reaching the number of 50 individuals per pod. Mating takes place in spring, the gestation period lasts for a bit longer than a year and one calf is born, weighing about 1 ton. The calves are nursed for another year and they reach sexual maturity at the age of 14-15 years. Females produce a calf once every 3 to 5 years and they are even believed to go through a menopause, due to their long lifespans. Amazingly, some whales with more than 120 year old harpoons in their body have been discovered, suggesting that these whales can live to be as old as 200 years. The only natural threat is the orca, that attack smaller pods of Bowhead Whales or prey upon their calves. The population of Bowhead Whales has suffered greatly during the whaling years, that lasted until 1966. These massive sea creatures were were widely used by the Eskimos, using the whales’ meat in their diet, constructing homes of the bones and using the oil produced by the whales as combustible. Although commercial whaling has been prohibited, Eskimos are allowed to hunt a number of whales each year for food and materials. 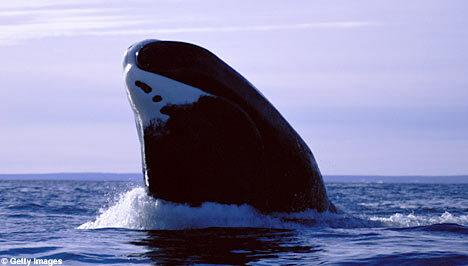 During the whaling years, the number of Bowhead Whales plummeted from about 50000 to about 20000. Currently, these whales are considered an endangered species and there are an estimated 12-15 thousand Bowhead Whales world-wide. Fortunately, it seems these whales do not face extinction in the nearest future, as strict rules are applied conserning their conservation. The number of Bowhead Whales is expected to rise over the years and hopefully a solid population count will be persist again one day.